As the Scenic Designer for The Diary of Anne Frank, Jack Lindsay decided how to tranform the ACT stage into the Secret Annex. From the placement of the walls and the doors, to the look of all the furniture and even the floor, Jack has a lot of decisions to make. He talks with the director and the other designers to make these decisions – and he always builds a scenic model to help along the way. ACT: Why is building a scenic model such an important step? Jack Lindsay, Scenic Designer: It’s a visual tool of where we’re headed. It’s utilized by the director to know how to stage scenes, by the actors to know where they’re moving, by the lighting designer to see how and where to light, and for the build crew to understand what they’re building. For me as the designer, it’s very helpful to formulate in three dimensions what I’m trying to achieve onstage. 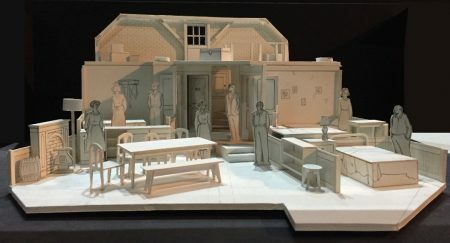 ACT: Do you start your scenic design by building the model? Jack: No, I start with a sketched plan, because there’s a lot of jockeying around in the beginning. Once I sketch the plans, I start blocking out the areas I’d like to develop. And then I build the model. Once the plan is approved by the director, I create elevations (which are specific designs that focus on the details of what needs to be built). ACT: Were the specific challenges you faced with this scenic design? Jack: With The Diary of Anne Frank, the challenge is that the ACT stage is very large, and the actual Secret Annex is very small. We wanted to create the kind of congestion in a space that happens when 8 people are confined to a small area for 25 months. That adds a lot of conflict, as does the fear of being discovered. We needed to portray the almost claustrophobic nature of the actual space – but we still had to think about lighting and sightlines, so the set can’t be too closed in. Usually I can give directors a lot of leeway with a design so that they can have a lot of choices in staging. With this show, it was different. The director and I talked about this beforehand – and he was onboard with me not giving him a lot of choices. ACT: What scenic decisions did you make to address this? Jack: We built a platform that is 6 inches above the Mainstage floor to define the living area. All of the living space is confined to this platform. The actual Annex had bedrooms on different floors, and while we couldn’t do that, we tried to translate by having those spaces separate from each other. I also tried to keep the square footage of our set as close as possible to the actual Annex. We’re within about 30 square feet.